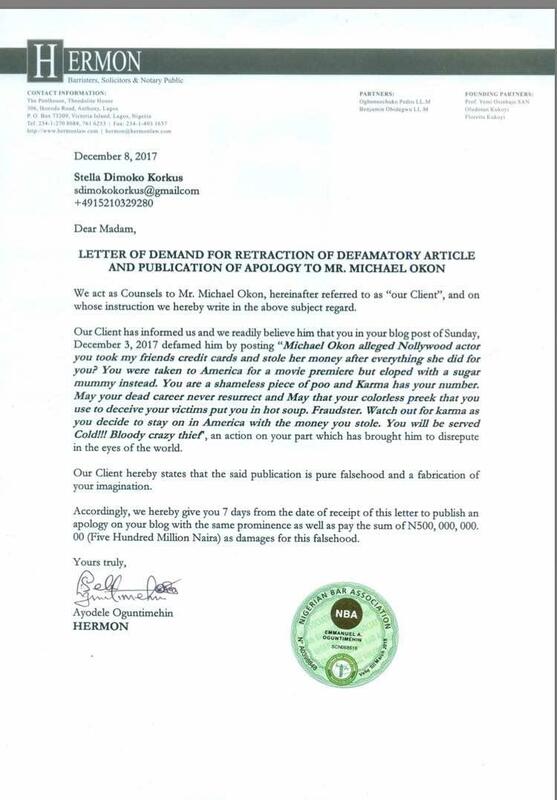 Nollywood Actor, Michael Okon has taken legal action against blogger Stella Dimoko Korkus popularly known as SDK for a defamatory post she shared on her Instagram page. 5 days ago, SDK accused the actor of allegedly stealing her friend’s credit cards and money, after she brought him to America. Now, the actor has responded and according to his Lawyer, SDK’s claim is false and fabricated. A legal document released states that SDK has been given 7 days from the date of the receipt of the letter to publish an apology with the same prominence as well as pay the sum of N500,000,000 for accusing him wrongly.